Raspberries provide high levels of vitamins and other nutrients as well as being delicious. Medicinal properties and botanical benefits have been of interest since the time of Jesus, reports the Berry Health Benefits Network of Oregon State University. Containing a powerful phytonutrient and antioxidant known as ellagic acid, red raspberries have been found to protect against a variety of health conditions and diseases. Red raspberries are known to help reduce inflammation and relieve pain associated with gout, arthritis and other inflammatory joint conditions due to the presence of anthocyanins, the chemical that gives them their red color. 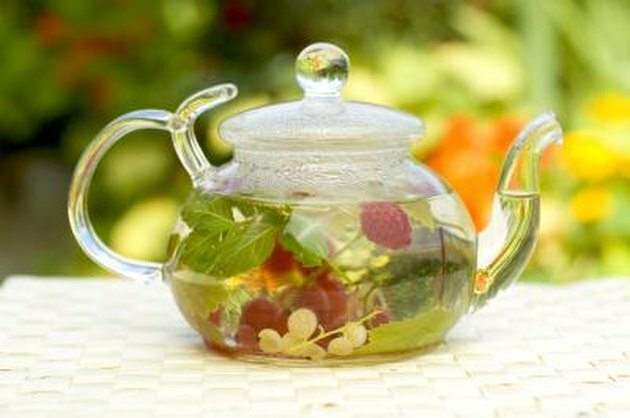 Drinking a tea made from red raspberries or red raspberry leaves three times daily may make a difference in the amount of anti-inflammatory medications needed to reduce pain in these conditions. Combine 1 ounce dried raspberries and leaves in 1 pint of boiling water and allow to steep fro 15 minutes. Strain and drink hot or cold. Used for thousands of years by Native Americans, red raspberry is helpful as a uterine tonic to strengthen the uterus during pregnancy and strengthen contractions during labor, according to Jethro Kloss in his herbal book, "Back to Eden." The tea doesn't bring on contractions, only helps to focus them, making them more effective. Do not use red raspberries during pregnancy if you are having complications. The Berry Health Benefits Network discusses tests that were performed at the Medical University of South Carolina's Hollings Cancer Center that showed that the body easily absorbs ellagic acid, which contributes to cell death in certain kinds of cancer. The cancers noted as being most readily affected were esophageal, tongue, lung, colon, liver, skin and breast cancer. High in vitamin C and gallic acid as well as other phytonutrients, the effects of raspberries and red raspberry tea have been show to help protect the heart and circulatory systems and slow down the advancement of age-related diseases, according to the Berry Health Benefits Network.